One of the various hats I wear at my company, Landscape Projects, is that of website maven. I say “maven” because although I designed our previous website, I’m not a website designer by training and couldn’t tell you the first thing about writing code. I just love photographing gardens so producing the photos for our new website – and working with our designer at Echo Communications – was where I came in when we concluded the site was due for a major overhaul. The site went live about a week ago. It’s image-heavy, with less text, but I think that’s a good thing in our business. Take a look by clicking the image below, and let me know what you think. Thanks for visiting. The home page for our new web site. The main photograph changes every four or five seconds. How many plants do you know that bloom in the winter? 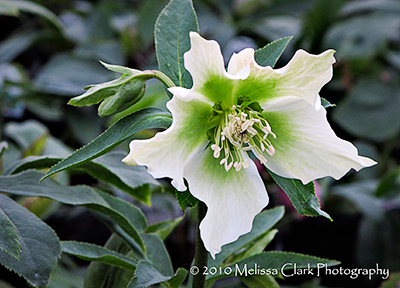 Hellebores, yes. Witchhazels, ditto. Snowdrops, depending on how mild the winter is. Today’s post, however, is in praise of Jasminum nudiflorum, or winter jasmine. 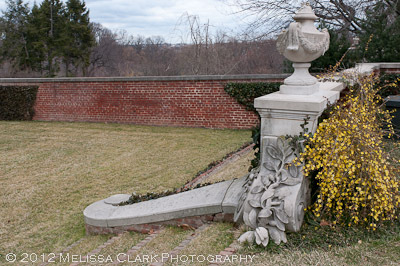 I first understood the allure of this arching, trailing shrub when I saw it in bloom at Dumbarton Oaks, early on in my education as a gardener. I mean, how beautiful is that? There are other locations at Dumbarton where the visitor comes across it, although not necessarily as dramatically placed. 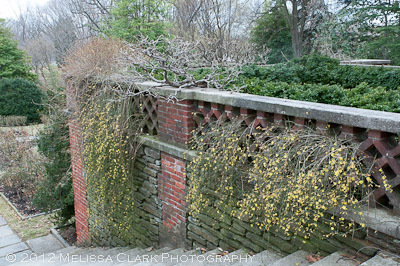 Growing through a stone "lattice" wall in another part of Beatrix Farrand's masterpiece. Behind the library, overlooking the grass steps. 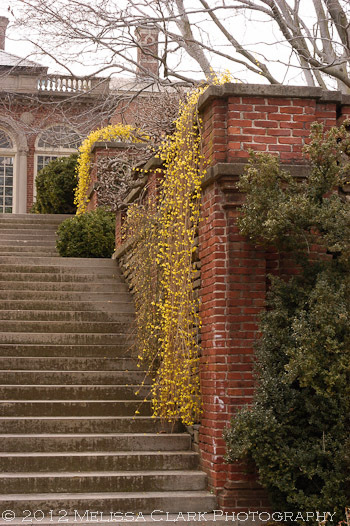 Winter jasmine’s period of bloom is roughly six to eight weeks long, a real plus for color-starved eyes in winter. However, the flowers don’t appear all at once. They open sporadically, which means that the effect can be less than spectacular. Best performance is in full-sun sites. According to one of my favorite garden publications, The Avant Gardener (don’t look for a website, it doesn’t have one), winter jasmine will spread up to 10 to 15′ wide and grow 2-3′ high. 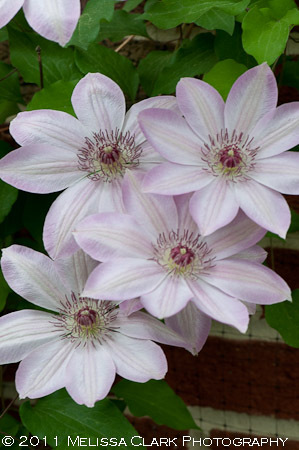 It’s hardy down to Zone 6 and supposed can be cut back to about 12″ high occasionally, to promote strong growth. 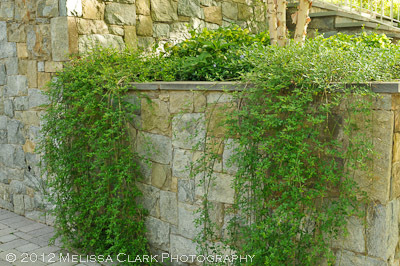 Even during the spring, summer and fall, however, winter jasmine is a good choice for spilling over stone walls in the landscape. The new shoots are green, and the foliage is delicate in appearance. Here it is in a Chevy Chase client’s garden last June. Winter jasmine looks good year-round. As you can see from this photo, a happy specimen of this plant will just keep growing . . . and growing . . . and growing. 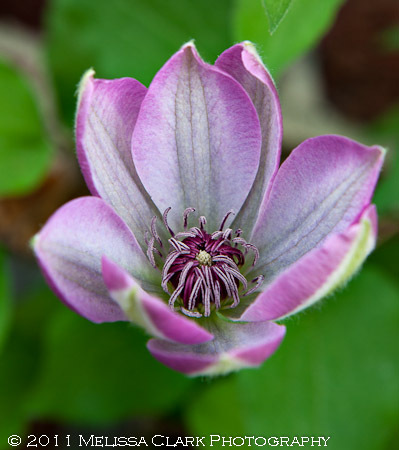 (This, of course, makes it a great choice for planting on sunny slopes – it may not be evergreen but since its shoots are green in winter, the ground won’t look bare.) So if there is soil at the bottom of the wall where you plant it, and you don’t want it to root there, a little maintenance will be necessary. Otherwise, sit back and enjoy it. My new 'Glowing Embers' Japanese maple uplit in snow. This is my new screensaver, at least until spring arrives. I took this photo (a 15-second exposure, on a tripod) the other night when we had an unexpected, very tiny snowstorm. I liked the photo so much that I posted it to Facebook and wrote, “Snow + up-lit Japanese Maple = magic. Takes some of the sting out of losing my beautiful crabapple.” Later the image was re-pinned on Pinterest to a “Just a little magical” board. Magic, indeed. Garden lighting is often thought of as an extravagance, an “extra” that you’ll get around to – someday. But I’ve concluded that it’s one of the most worthwhile investments you can make, to dress up even a new landscape, in terms of bang for the buck. My own front yard is a good example. I had to spend a lot of money this year taking down and replacing two trees,including getting the tree stumps ground out, and replanting one bed area around the new ‘Riversii’ beech. I may have to spend more this coming year because I suddenly have a sunny exposure where I had shade before, and I don’t know which of my current plantings will survive. It broke my heart to see how small my new trees were when they went in, and how dark the front yard seemed at night. The old trees, you see, had been uplit beautifully. The branches of my old American beech tree uplit at night. Without the lighting, the front of the house looked bleak and sad at night, with the only lights on my steps and two carriage light fixtures on either side of the front door. So I bit the bullet and had lighting installed on the ‘Riversii’ and the new Japanese maple by my go-to lighting contractors, Outdoor Illumination Inc. Neither tree is large, but the difference the lighting makes to the house and landscape is amazing. 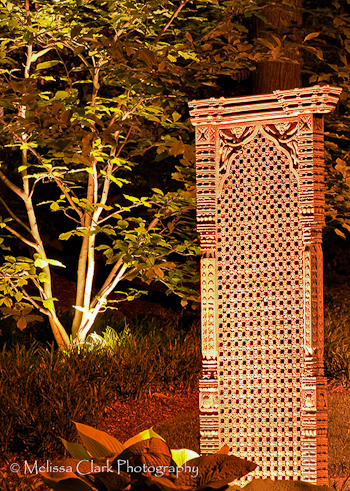 Lighting can be used not only for trees but to draw your eye to other built elements in the garden, such as these wooden Nepalese screens one of my clients installed as a kind of sculpture. 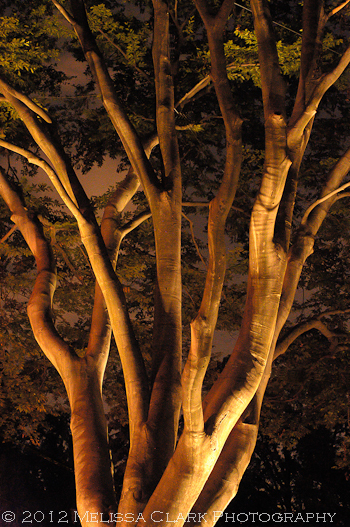 Three wooden panels surround a young copper beech in a garden in Chevy Chase, Maryland, uplit by soft spots. 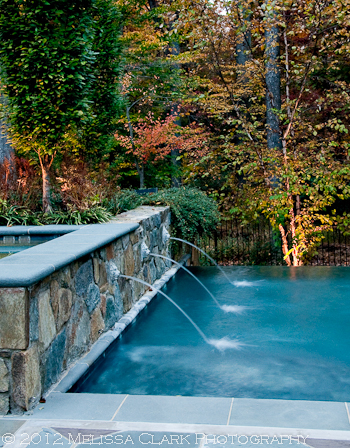 In a more modern landscape setting, you’ll see lights used around pool perimeters, as here in this Potomac, Maryland garden designed by landscape architect H. Paul Davis. Spotlights for the pool jets as well as the hornbeams and river birches adjacent to the water area create a beautiful effect as dusk descends. 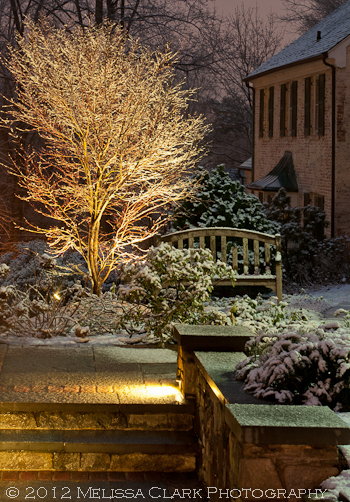 But even away from paths and major trees, lighting in the garden can contribute to an atmosphere of calm and magic. 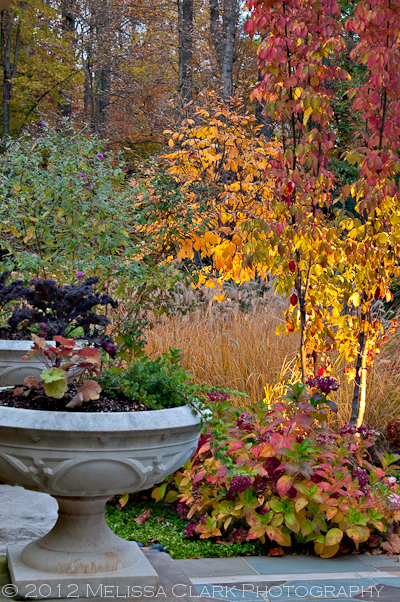 As evening approaches, a garden bed with color fall foliage is illuminated, bringing the outside in for a little longer. 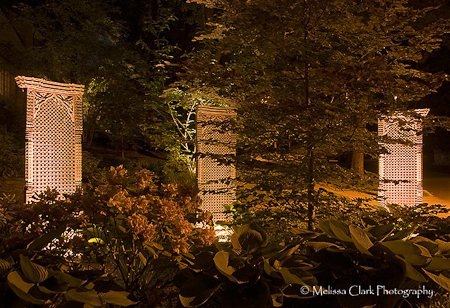 So consider some “night lights” if you’re working on improvements to your garden. You won’t regret it. 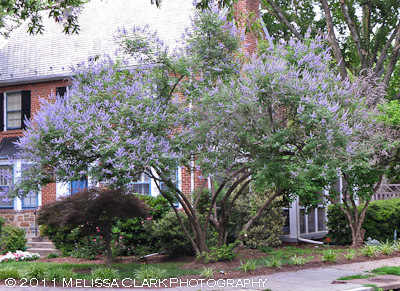 It is that time of year when wherever you look, crape myrtles are strutting their stuff. I’ve been known to favor them in certain design situations – when clients request them (assuming they have enough sun), when I want a tree whose size can be kept in check, and when I want four-season interest in a sunny site with no irrigation. 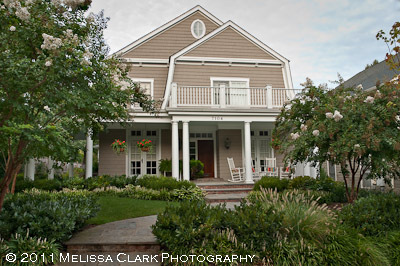 A trio of white 'Natchez' crape myrtle trees frame the entry walk to this house in Chevy Chase. Recently, however, I’ve been noticing how commonly these trees are used in commercial or public spaces, for screening or to provide a colorful setting for seating areas. 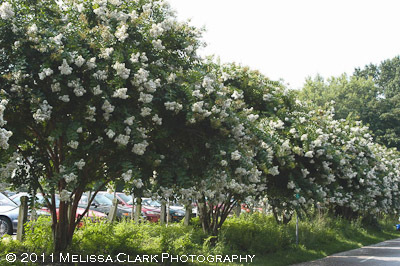 Here is an “allee” of ‘Natchez’ crape myrtles lining a pedestrian/biking path in downtown Bethesda, Maryland. A row of Natchez crape myrtles screens a parking lot from a bike path in suburban Maryland. 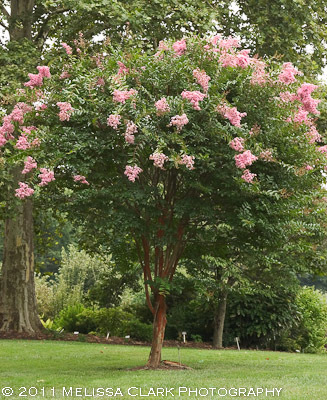 On my trip home last weekend from our local Giant grocery store in Silver Spring, I saw crape myrtles used in three different ways. One was lining the sidewalk in planter squares along two rows of restaurants, coffee shops and dry cleaning establishments. Anchoring this ‘allee’ were two other groupings. One was by some outdoor tables at a Caribou Coffee shop, screening patrons’ views of the busy street beyond. Across from it was this trio of beauties, surrounded by some Knockout roses and striped zebra grass, neither of which seemed to be performing as well as the crape myrtles. 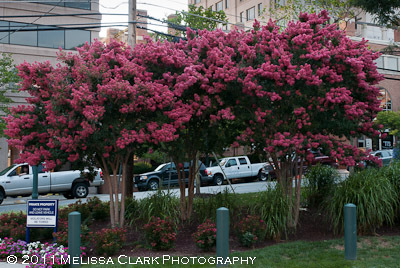 Dark pink crape myrtles in a shopping center in Silver Spring. The actual blossoms were a bit lighter than this picture shows (the trees were in full shadow at this point). But they were definitely a hot pink, as opposed to the lighter lavender-pink of the ones across the way at the coffee shop. Which led me to wonder why whoever designed these areas had chosen different cultivars, and ones that arguably clash in terms of their colors? And even closer to home, here’s a small pedestrian island at a busy intersection that I see on my way to work most mornings. 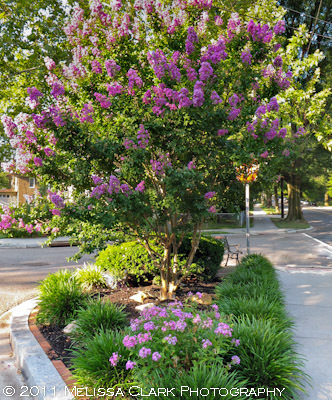 A deep pink-purple crape myrtle in a small pedestrian island on the border between Washington, DC and Chevy Chase MD. Note the matching-colored phlox in the foreground! 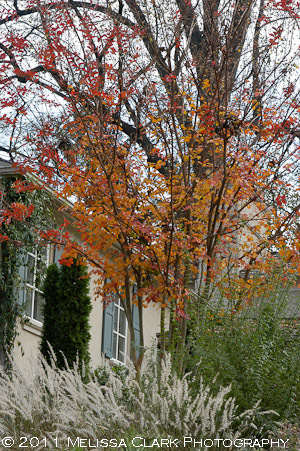 Fall foliage on crape myrtles is spectacular. and exfoliating bark. Their down sides are few: the blossoms are messy when they fall, requiring diligence if you plant them near a patio or other hard surface; and they need to be planted (at least in this area) no later than the end of October (and even that is pushing it). 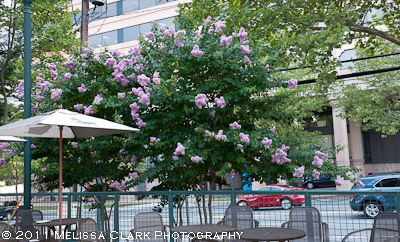 An 'Osage" crape myrtle in bloom. and a shot of its gorgeous exfoliating bark. 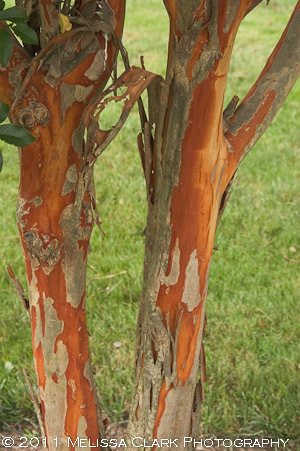 Exfoliating bark makes crape myrtles truly wonderful four-season trees. I suppose their low-maintenance nature, and the ability to choose among cultivars ranging from shrub size to 20-30′ (‘Natchez’ and a few of the other varieties) is what accounts for their apparent increasing popularity outside of residential landscapes. I’d be interested to know if any readers in Zones 7 and warmer (where these trees are hardy) see them often outside of home gardens. For more information on the care of Lagerstroemia, visit this part of the National Arboretum’s website. As summer is ushered in here, I’ve noticed a lot of plants that are blooming earlier than usual, perhaps due to our rainy spring and early onset of hot weather. 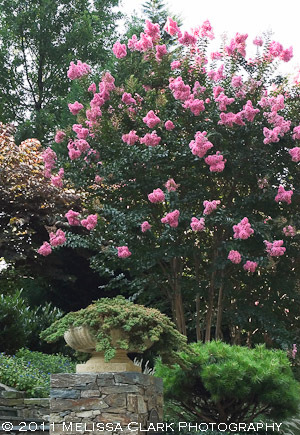 I see crape myrtles in full bloom in some of the gardens I visit, for pity’s sake – usually they have the grace to wait until July or August, stretching out the summer season a bit. 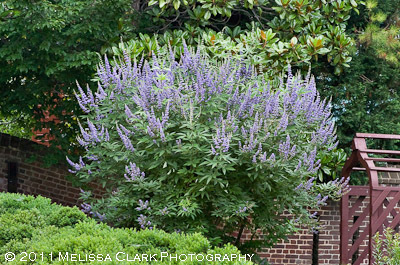 One of the early bloomers I’m seeing these days is Vitex agnus-castus, or the chaste tree. To be honest, the first example I saw of this shrub when I was studying woody plants at the National Arboretum didn’t impress me a lot. Touted as an alternative to butterfly bushes (which are not my favorite plants because they are so awkward in winter), I wondered why they would be considered superior. Then I came across this specimen in the garden of the William Paca House in Annapolis, and I understood. The shape, the color, the leaves, all combined to create a gorgeous impression. The blossoms have a spicy fragrance that does indeed attract butterflies as well as hummingbirds, apparently. 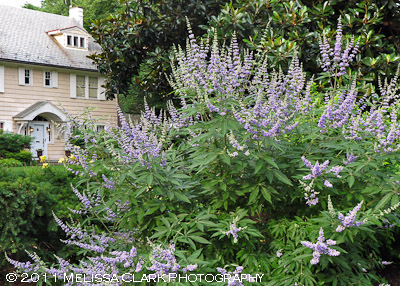 The Vitex is hardy to Zone 7 (or possibly 6, in protected sites). Around here, one usually sees it as a shrub. The other day I saw it anchoring the corner of a mixed border bed in a lovely sidewalk garden area in the District of Columbia not far from where I live. Most of the blossoms you see here are on new growth, as the Vitex is a “cut-back” shrub. A Vitex shrub at the corner of a mixed border, providing summer color on a hot day. But sometimes, when a Vitex is extra happy, it can grow to tree size. One night recently, on my way home, I saw just such an example, and stopped to photograph it. A tree-sized specimen in northwest Washington DC. The garden owner was outside watering a new azalea, and was kind enough to talk to me. Having lived in the house only three years, she didn’t know how old the Vitex was, but obviously treasured it. She said the past winter had been hard on it, causing them to lose some of the interior branches, and that in past years the blooms had covered virtually the entire tree, creating a spectacular effect. I can believe it, given how great the tree looked even in its current state. I’ve planted Vitexes for a number of clients, and will continue to do so. For a little background on its origins and stories behind its name, click here. But more importantly, spread the word to those friends of yours thinking about planting butterfly bushes – suggest that they consider a Vitex, instead. and its almost perfect form as it presents itself fully. How can you not love this flower? Singly or in groups, it never disappoints. 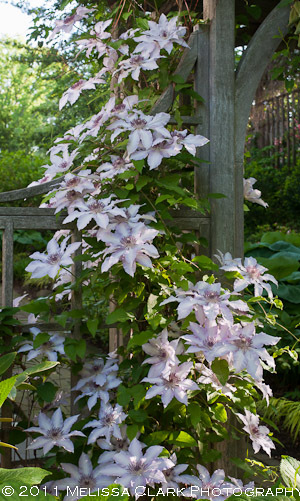 I must explain that this clematis – which will probably never bloom as prolifically as the Blue Moon clematis on my client’s arbor – represents to me a real triumph. It gets absolutely NO direct sun; I planted it behind a large old pieris in my front yard, against the brick wall of my north-facing house. Its colors are delicate and its shape gorgeous. I should plant it for clients more often. 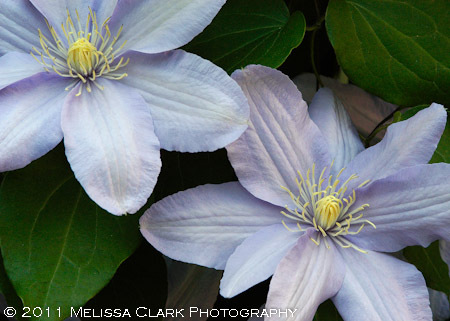 Speaking of planting, if this post has whetted your appetite for any of these clematis, I can recommend an East Coast mail-order nursery that has supplied me with my plants and does a phenomenal job of packing and shipping these delicate treasures, Completely Clematis ( in Massachusetts) . 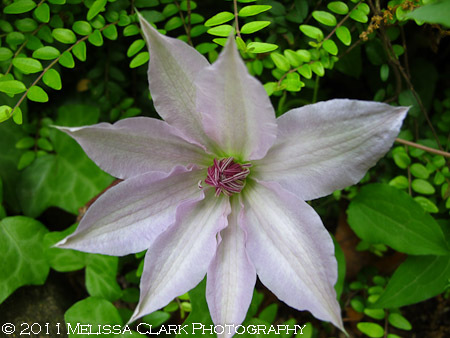 On the West Coast, Chalk Hill Clematis used to sell clematis online but apparently has become primarily a cut-flower supplier. If any of my readers can recommend other trusted online suppliers, I’d love to know about them. And now for something different. 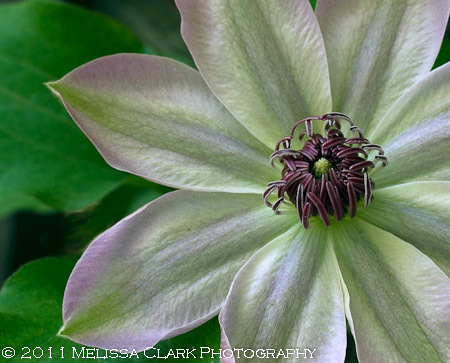 Last year I put together a photo essay for my camera club’s spring program, featuring images taken over the years at Chanticleer Garden. Here’s the chance for you to see it too. I hope you enjoy it as much as I did making it and sharing it with other friends. Thank you, YouTube.